Continuing our look at weapons in Ehdrighor, we dive a bit into the world of blades. Please note that adding these weapons with their inherent stress bonuses to your game will make it a bit more deadly. Blades can generally be broken down into small (0), short (1), medium (2), and heavy (3). The category of the blade determines its base damage bonus. There are tons of different blades that exist that are easily made, though not particularly durable, and fit one of these categories but aren’t really noteworthy. Most people will have one of these general blade types and the vast majority are some variation on the knife or long-knife. Such generic blades are hastily made and of cheaply accessible material. They can be obtained with a mediocre resource roll. It is worth noting that while knife-like weapons enjoy great proliferation among the people swords, in general, do not. This is mostly due to a stigma they have carried since the Upheaval of being weapons created for the sole purpose of killing other peoples. 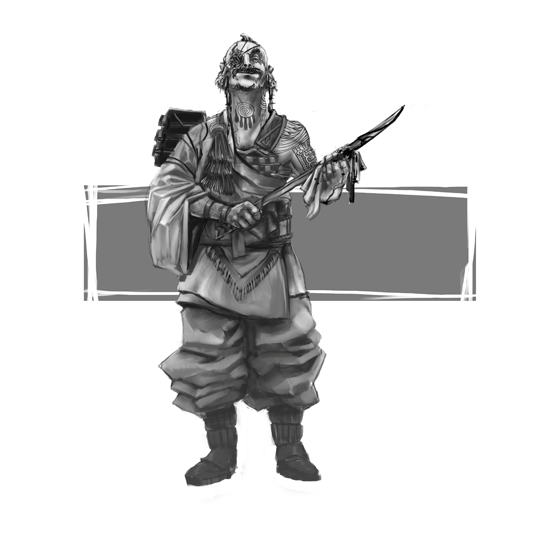 They are often seen as “Bandits weapons” at worst and unsavory at best. A person who carries a sword is presumed to be looking for a fight and this can and should be compelled. Since the majority of people using them are thugs and bandits, swords are most likely to be designed to appear menacing in their aesthetics and brutal in their implementation (serrated edges, hooks, etc). This means swords have a high intimidation factor while also inducing a social penalty. A sword in hand can always be invoked to intimidate and compelled for a penalty in non-threatening social encounters. In this context sword proper, would be items that are designed to be an look like a sword (short to long). Depending on it’s make and size long machete-like weapons fall into this category. The more it deviates from a standard sword appearance and functionality the more likely it is to be treated as a separate weapon. This of course varies from culture to culture and village to village. Crow Talons: These are the blades that normally sit at the ends of the crowlance. They are detachable, forming a type of long knife with a very short handle which is meant to allow the Crow to shift it quickly back and forth between their fingers , switch the facing of the blade and point. Because of the short handle they are easily dropped by novices. The handle has a locking mechanism that lets it push back up to the base of the blade and forms part of the locking mechanism that keeps it attached to the crowlance. The blade can twist again, fold, and lock perpendicular to the curved blade turning it into a sort of climbing implement that allows the user to use the weapon to create an advantage for Climb rolls. When in this state its damage goes down to Mediocre (0) and its control goes up to -2 and can only do pierce type consequences. Obtaining one of these requires some sort of connection to the Crows either through your aspects or good use of Contacting and Rapport. Humming Bird Blade: A long, flat, stiletto type of knife meant to be dual wielded. Training with them teaches the wielder to keep them spinning quickly and continually dance around their target in tight circle patterns. The blades is very flexible. Being made of a special application of layers of resin and bamboo. The end result is something that is very sharp and very hard to break. The focus of most fighting with the hummingbird blade is on the point of the blade as the edges lose their sharpness quickly and must be maintained. When in motion they tend to catch the air and make a fluttery/buzzing sound a bit like the flurry of wings. These knives are favored by the Jays because of their elegance and are good for finding the weak spots of foes with armor shells. Bleeding can only be applied if the wielder succeeds with style and causes a consequence. When bleeding is applied to a target, it causes that target to take +1 physical stress whenever it takes stress thereafter, until the target receives some medical attention (typically an Average difficulty check). This doesn’t stack with itself. Once bleeding is applied to a target, it can’t be applied again until the first bleeding has subsided or been healed or through the effects of special stunts. The extremely sharp point allows the wielder to reduce the armor of an opponent by 1 with each strike. Obtaining one of these requires some sort of connection to the Jays either through your aspects or good use of Contacting and Rapport. Grass blade: These are long, thin coils of metal that are something of a cross between a whip and a blade. Used a great deal in the Beyduun Wastes they are favored by many warrior societies (especially the Red Pale) because of the difficulty in using them and the general deadliness of them. This blade also causes bleeding as detailed in the hummingbird blade description. Carrying one of these in the forge cities of the Salduun is a privilege for members of the Red Pale, a warrior society that serves as the state approved elite fighting force. It is a crime for anyone else without the proper evidence of permission. Reave blade: This nasty, heavy two handed weapon is something a of a bladed club. It’s all lengths of blade connected at a central point with a long haft. The haft itself is usually about two feet long, while the assembly of blades are about 4 feet. The weapon is incredibly punishing and made to hurt and shock an enemy. Succeeding with style allows you to create the advantage “stunned” on the enemy which can be compelled to weaken their attacks or defenses. This weapon is very much associated with being the weapon of powerful bandits and killers. Typically carried by strong members of a bandit tribe or the leaders second. It is also very effective when used from a mounted position but much harder to wield because it has to be wielded one handed. In such circumstances its control becomes -3 but the user gains the ability to create the advantage “prone” on a target when succeeding with style. That’s all for now. There is more to come in future entries. I decided to move axes to their own entry so that’ll be the subject of the next Ehdrigohr Gear article. Axes will be the subject of the next entry. Ehdrigohr, Ehdrigohr Gear, Expansion. Bookmark. I adore this game – about to order the hardcover. Finally- THE game done in a beautiful way! I greatly appreciate your work here! I’m looking forward to so much more. Thank you very much for your words, exploring, and finding something of value in Ehdrigohr. I’m glad it speaks to you.